DETROIT -- The links golf course in question begins in the corner of the village and makes its way through the fescue out along windswept water that separates nations. A railway skirts the golf course, and once the routing of the holes reaches the far boundary of the property, it turns for home, with a view of the wee skyline rising above the mounds and hillocks. Surely the description fits the Old Course at St. Andrews, where golf was born, or Prestwick Golf Club in Scotland, which held the very first 12 British Open Championships, beginning in 1860, over its 12-hole course? Nae, laddies and lassies. 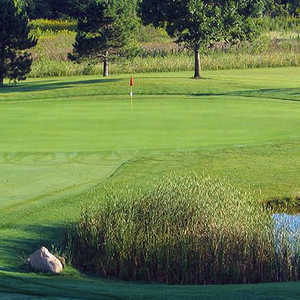 The links course described is none other than Wyandotte Shores Golf Course, a municipal golf course in a suburb of Detroit, MI. The curious thing about Wyandotte Shores is that is was not designed nor built as a replica course to mimic Scotland's first-ever golf courses. There are plenty of those links-like reproductions such as Grand Cypress in Orlando, the Ocean Course at Kiawah Island, S.C., Pacific Dunes in Bandon, Ore., and others in Myrtle Beach. Wyandotte Shores, though, without setting out to do it, closer matches the original model for the creation of a golf course through reclaiming otherwise useless land, serving a recreational purpose for citizens of its town, and playing right into and out of town. Wyandotte is a small residential and industrial town 10 miles south of Detroit, named for a Native American tribe. The town proper covers only four square miles, but always has displayed an independent streak, insisting on its own city services for power, water, waste collection, and cable television. A rigid city certification system for housing has insured the upkeep and building standards of the old community, and an assertive recreation program provides programs for baseball, softball, tennis, hockey, football, swimming, boating, rowing and indoor or outdoor skating, among other activities. Thanks to the creative vision of city official Leslie Lupo, Wyandotte sponsors countless festivals and city events, such as the Waterfest, Third Fridays, a Street Art Fair, fireworks, a circus, and parades on Independence Day and at Christmastime. Another undeniable feature of Wyandotte's charm and similarity to well known UK golf locations is the number of corner pubs and taverns. An unofficial count numbers more than 80 in a town that is two miles long by two miles wide. Not boisterous clubs, but rather quiet, simple watering holes such as Gold Star Bar, R.P. McMurphy's, the Oak Café, and Brooklyn's. To be fair, Wyandotte also has more than its share of old churches and parochial schools. The hub of Wyandotte is its downtown area, a gathering of two-story shops, storefronts, lofts, apartments, and homes that line Biddle Avenue for about six blocks. Walking distance in downtown Wyandotte are community essentials like the hospital, library, funeral home, bank, post office, recreation center, theatre, and City Hall. Downtown Wyandotte offers plenty of non-essential street-side strolling comforts too, such as Flower House Florist, the Razor's Edge Art gallery, jewelers, gift shops, Stroh's ice-cream parlor, Chelsea men's clothier, dress shops like Madolyn's and the Willow Tree, The Bomba Shack hair stylists, furniture stores, photography studios, and coffeehouses, the most popular and colorful being "The Grind -- an American Coffeehouse," which offers special blends like "Snickerdoodle" in a relaxed, non-smoking environment with live entertainment and plenty of colorful regulars. The downtown area runs along an expansive waterfront city park, pier and boat club that looks out onto the Detroit River, actually a strait, which connects Lake Erie to Lake Huron via Lake St. Clair. Ontario, Canada is plainly visible from Wyandotte across a river that is a playground for pleasure boaters, fishermen, and duck hunters and an essential waterway for international shipping. Ten years ago, city officials saw the opportunity to reclaim more riverfront land, a parcel that had been home to a chemical plant that was razed. The land was unusable for residential development and most other uses due to the previous industrial use. For the splendid sum of one-dollar, the BASF Company leased the strand of waterfront land at the south end of town that "linked" Biddle Ave to the river. 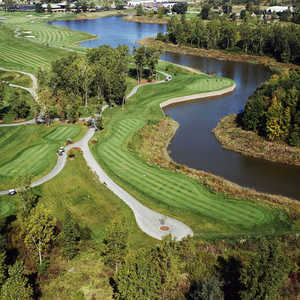 Some of the land was used to allow the public even more access to the riverfront, and for the rest, Michigan golf course designer Jerry Matthews was selected and given room to design and build a nine-hole links course at the corner of town. Like notable courses and golf clubs in the UK, the clubhouse facilities at Wyandotte Shores are modest and unremarkable -- the place is about golf, not shopping or dining or shoe shining. Players simply tug their clubs from the boots of their automobiles, pay their fees, drag a trolley, and play the holes. Americans who have not traveled to the birthplaces of golf may find this hard to believe, but to this day most world-class Scottish courses do not offer curbside bag-drop valet services, elaborate locker rooms, caddies, club cleaning or motorized carts. Neither does Wyandotte Shores, with the exception of the buggies. "We recognize the importance of golf and what it can do for our community," said Wyandotte Mayor Leonard Sabuda. Prices at Wyandotte Shores remain eminently affordable -- less than $20 for 18 holes. 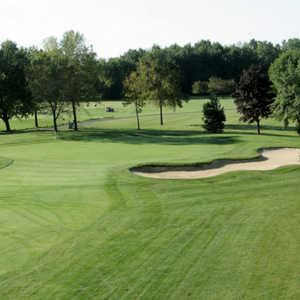 "We understand that golf is a business, however, we also understand that Wyandotte Shores is provided as a recreational opportunity to our citizens." The existing nine, however, perfectly suits its purpose. It's playable in length -- about 3,000 yards -- and challenging when the golden fescue is allowed to rise from the rough and crest the dune-like mounding. The third and fourth holes, both par-4s, play along the south end's Biddle Avenue homes and stores, much like holes at St. Andrews, Prestwick, Ireland's Lahinch, and astonishingly similar to the closing holes at Scotland's Machrihanish Golf Club in Kintyre, which was founded in 1876. A recent visit to the remote Machrihanish begged not a comparison of the quality of courses but rather the similarity of the cozy small town, neighborhood settings. Two small ponds corner each of the par-3s, both of which play into the ever-present prevailing wind. The par-4 eighth and par-5 ninth holes at Wyandotte Shores are invariably the most talked about, for they both play directly along the river right back into the corner of town. The water to the right is in play on both of these holes, and while the eighth throws a nasty, gnarly grass pot bunker at players who miss the green short, the ninth has plenty of fescue waiting to the left for those who overcorrect for the water right. While the Detroit skyline is visible further up the river, Wyandotte's own quaint little presence serves as backdrop to the fescue. Slugging one's clubs over their shoulder and walking through town to the golf course is not uncommon in Scotland, and may be an increasingly common one in Wyandotte, where a good round can be followed by a good pint or warming java. Local accommodations range from the non-descript Holiday Inn in Taylor to the Ritz Carlton in Dearborn. Both are within 15 minutes away. "The Grind -- an American Coffeehouse" serves soup, bagel-wiches, and turkey rolls along with rich desserts such as Oreo Bash. Pull up a couch and warm up with a Kona or Jamaican Blue Mountain special. Bigger appetites should try R.P. McMurphy's on the other side of the street, which serves fish and chips, burgers, chili and more in a pub atmosphere. Both are owned and operated by local residents.